Chu (Chinese: 楚, Old Chinese: *s-r̥aʔ) was a hegemonic, Zhou dynasty era state. From King Wu of Chu in the early 8th century BCE, the rulers of Chu declared themselves kings on an equal footing with the Zhou kings. Though initially inconsequential, removed to the south of the Zhou heartland and practising differing customs, Chu began a series of administrative reforms, becoming a successful expansionist state during the Spring and Autumn period. With its continued expansion Chu became a great Warring States period power. Also known as Jing (荆), Jingchu (荆楚) and Shu (舒), Chu included most of the present-day provinces of Hubei and Hunan, along with parts of Chongqing, Guizhou, Henan, Anhui, Jiangxi, Jiangsu, Zhejiang, and Shanghai. For more than 400 years, the Chu capital Danyang was located at the junction of the Dan and Xi Rivers near present-day Xichuan County, Henan, but later moved to Ying. The ruling house of Chu originally bore the clan name Nai (嬭) and lineage name Yan (酓), but they are later written as Mi (芈) and Xiong (熊), respectively. In its early years, Chu was a successful expansionist and militaristic state that developed a reputation for coercing and absorbing its allies. Chu grew from a small state into a large kingdom. King Zhuang was even considered one of the five Hegemons of the era. After a number of battles with neighboring states, sometime between 695 and 689 BCE, the Chu capital moved southeast from Danyang to Ying. Chu first consolidated its power by absorbing lesser states in its original area (modern Hubei), then it expanded into the north towards the North China Plain. The threat from Chu resulted in multiple northern alliances under the leadership of Jin. These alliances kept Chu in check, with the first major victory won at the Chengpu in 632 BCE. Freed from its difficulties with Wu, Chu annexed Chen in 479 BCE and overran Cai to the north in 447 BCE. This policy of expansion continued until the last generation before the fall to Qin (Lu was conquered by King Kaolie in 249 BCE). However, by the end of the 5th century BCE, the Chu government had become very corrupt and inefficient, with much of the state's treasury used primarily to pay for the royal entourage. Many officials had no meaningful task except taking money and Chu's army, while large, was of low quality. The Chu people are not strong. Their lands stretch far and wide, and the government cannot effectively administer the expanse. Their troops are weary and although their formations are well-ordered, they do not have the resources to maintain their positions for long. To defeat them, we must strike swiftly, unexpectedly and retreat quickly before they can counter attack. This will create chaos in their formations and reduce their fighting spirit. If we strike repeatedly, it will wear them out. Thus, with persistence, their army can be defeated. Chu's size and power made it the key state in alliances against Qin. As Qin expanded into Chu territory, Chu was forced to expand southwards and eastwards, absorbing local cultural influences along the way. By the late 4th century BCE, however, Chu's prominent status had fallen into decay. As a result of several invasions headed by Zhao and Qin, Chu was eventually subjugated by Qin. The Chu realm at its most powerful was vast with many ethnicities and various customs. Though diverse, the Chu people were united by a common respect for nature, the supernatural, and their heritage and loyalty to their ruling house and nobility, epitomized by the famed Chu statesman-poet Qu Yuan and the Songs of Chu. The Chu populace in areas conquered by Qin openly ignored the stringent Qin laws and governance, as recorded in the excavated bamboo slips of a Qin administrator in Hubei. Chu was one of the last states to fall and its people aspired to overthrowing the painful yoke of Qin rule and reestablishing a separate state. The attitude was immortalized in a Chinese expression about implacable hostility: "Though Chu have but three clans, it must kill Qin" (楚雖三戶, 亡秦必楚). After Ying Zheng declared himself the First Emperor (Shi Huangdi) and served his short reign, the people of Chu and its former ruling house organized the first violent insurrections against the new Qin administration. They were especially resentful of the Qin corvee; folk poems record the mournful sadness of Chu families whose men worked in the frigid north to construct the Great Wall of China. The Dazexiang Uprising occurred in 209 BCE under the leadership of a Chu peasant, Chen Sheng, who proclaimed himself "King of Rising Chu" (Zhangchu). This uprising was crushed by the Qin army but it inspired a new wave of other rebellions. One of the leaders, Jing Ju of Chu, proclaimed himself the new king of Chu. Jing Ju was defeated by another rebel force under Xiang Liang. Xiang installed Xiong Xin, a scion of Chu's traditional royal family, on the throne of Chu under the regnal name King Huai II. In 206 BCE, after the fall of the Qin Empire, Xiang Yu, Xiang Liang's nephew, proclaimed himself the "Hegemon-King of Western Chu" and promoted King Huai II to "Emperor Yi". He subsequently had Yi assassinated. Xiang Yu then engaged with Liu Bang, another prominent Chu rebel, in a long struggle for supremacy over the lands of the former Qin Empire, which became known as the Chu-Han Contention. The conflict ended in victory for Liu Bang: he proclaimed the Han Dynasty and was later honored with the temple name Gaozu, while Xiang Yu committed suicide in defeat. Later Chu culture was known for its affinity for shamans. The Chu culture and government strongly supported Taoism and native shamanism supplemented with some Confucian glosses on Zhou ritual. 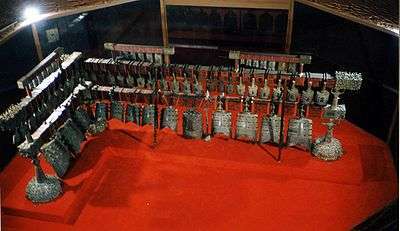 The naturalistic and flowing art, the Songs of Chu, historical records, excavated bamboo documents such as the Guodian slips, and other artifacts reveal heavy Taoist and native folk influence in Chu culture. The disposition to a spiritual, often pleasurable and decadent lifestyle, and the confidence in the size of the Chu realm led to the inefficiency and eventual destruction of the Chu state by the ruthless Legalist state of Qin. 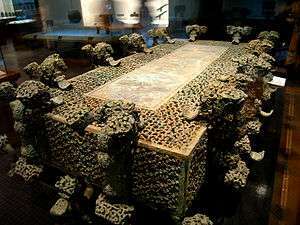 Even though the Qin realm lacked the vast natural resources and waterways of Chu, the Qin government maximized its output under the efficient minister Shang Yang, installing a meritocracy focused solely on agricultural and military might. ↑ Baxter & Sagart (2014), p. 332. ↑ "关于黄帝和楚国的姓氏问题". zgxiong.com. Retrieved 23 October 2015. 1 2 3 Sima Qian. "楚世家 (House of Chu)". Records of the Grand Historian (in Chinese). Retrieved 3 December 2011. ↑ "Yu Ding: Evidence of the Extermination of the State of E during the Western Zhou Dynasty (禹鼎：西周灭鄂国的见证)" (in Chinese). Retrieved 23 October 2010. ↑ Sources differ on the exact date. ↑ "The Warring States" (in Chinese). Retrieved 4 October 2010. ↑ Traditionally taken to be the Qu (屈), Jing (景), and Zhao (嬭). ↑ Sima Qian. Records of the Grand Historian, "Biography of Xiang Yu" (項羽本紀). ↑ See also, the Tsinghua Bamboo Slips. 1 2 Ziju (子居). 清华简《楚居》解析 (in Chinese). jianbo.org. Retrieved 10 April 2012. ↑ Note: Shiji calls him Xiong Zhihong (熊摯紅), and says his younger Xiong Yan killed him and usurped the throne. However, Zuo Zhuan and Guoyu both say that Xiong Zhi abdicated due to illness and was succeeded by brother Xiong Yan. Shiji also says he was the younger brother of Xiong Kang, but historians generally agree that he was the son of Xiong Kang. ↑ Allen, Richard. "Star Names – Their Lore and Meaning: Capricornus". ↑ "Richard Hinckley Allen: Star Names – Their Lore and Meaning: Ophiuchus". penelope.uchicago.edu. Retrieved 23 October 2015.